This base model evolved (from the B1) and was developed with customer feed back, to incorporate a number of improvements – notably a reverse gear, re positioning of the exhaust, larger air filter, upgraded carburetor and front protection to the engine, latterly to take internal wheel weights. It was renamed the Energic motoculteur B5. Eventually weighing in nearer 280kg (priced at 6850fr). 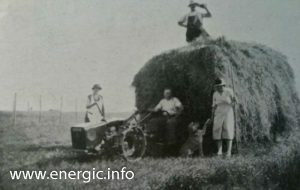 Energic motoculteur B5 pulling hay stack. At the same time as the improved Energic motoculteur B5 model introduction a new Energic motoculteur B4 model was introduced. This model incorporated the chassis specification as the B5 model, but using a 4 stroke engine, 3 speed and 5cv (priced at 7850fr). This was the fore runner to the C7 B4L and was discontinued when the new engine from Motobecane became available at 7cv. (A Slanzi engine version has just been discovered – see colour photo below). 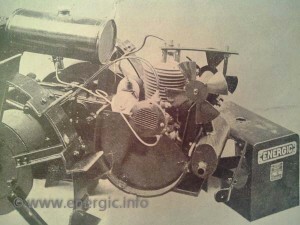 In 1933 a new variant of the Energic motoculteur B5 arrived, the B5E. A specialist ultra model for narrow plantations. Its width could be altered to 0,50m, 0,61m and 0,72m. It was identical mechanically in every respect to the Energic motoculteur B5 but for the narrow width. Very few where produced. Narrow width Energic Motoculteur B5E. 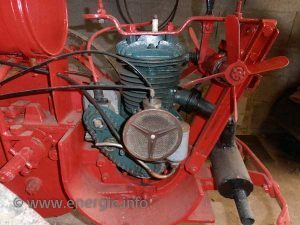 The Energic motoculteur B and B5 engine, being 2 stroke, was lubricated using Fuel/Oil mixture at a ratio of 8%. Consuming approx. 1 to 1.5 liters of fuel per hour – under normal conditions. Weighing in at just 240Kg’s it was used for light work. With machine widths obtainable between 0.57m, 0.71m and 0.82 of a meter – which was achieved by changing the wheels inside and out on the axles. Turning/direction changes were obtained by blocking one wheel whilst the other rotated freely, by pushing a lever on the handlebars to engage the blockage of the wheel. It had Chain drive from the modified motor cycle moteur, with implements attached for towing using the “Breveté S.G.D.G” hitch/towing system. All the transmission gears ran in a simple reservoir/bath of oil self lubricating. 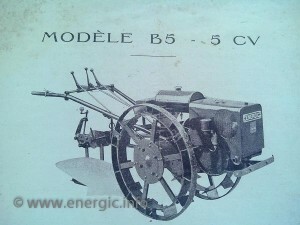 The Energic motoculteur B5 offered a plowing depth on average between 15 to 20 cms. (Colour photo courtesy or Francois Baudat). Fraise Rotative rotivator, Brannette, Bineuse extirpateur 5 soc, Bineuse a versoirs, Bineuse 3 soc, Extirpateur expansible a 9 pointes, Cultivateur a dents flexible, Buttoir, Scarificateur 5 soc, Corps de charrue, Corps de charrue triplex, Corps de charrue déporté triplex, Arrache pommes de terre, Intercep, Paroir pour allée, Rateau s’adaptant a l’arrière, Roues de profondeur pour bineuse, avec montage, Bandage de roulement.